It turns out Martin Truex Jr. can be beat on a 1.5-mile track. Kevin Harvick proved it at Texas. As it turns out, the most dominant guy on the season, especially on tracks that make up the majority of the schedule, is not invincible after all. Don’t get me wrong, I still feel that Martin Truex Jr. is the hands-on favorite for the championship this year. It’s hard to deny the success he’s had this year, and how flat out dominant the team has been on all styles of track. He is the guy to beat every single week. Well, given the right circumstances, it can be done. In this case, it wasn’t a matter of a mistake by his crew, or a mistake on the track. It was a simple fact that the guy in second place ran down the leader, and made the pass. That means that the best car at the time made the right move to win the race. It didn’t take using the bumper, or making a dirty move. It simply was a driver making the right move, at the right moment, and not looking back. That is exactly what Kevin Harvick pulled off on Sunday in Texas. With that, Harvick can say he’s going after a championship. 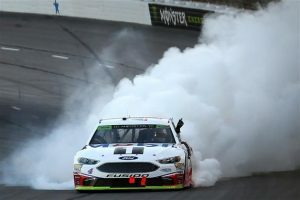 He now joins Kyle Busch as two of the four drivers that will do battle in the season finale for a straight-up, best driver wins the championship. Does that mean he will be favored over Truex Jr? Maybe not, seeing as the success the No. 78 team has experienced this year is undeniable. But what is different is that in Homestead, Harvick has won at the track. After all, it took him winning in 2014 that led him to his first championship. So I guess the way he’ll win this championship is to just go for it. That may be the only way Truex Jr. doesn’t hoist the big trophy at the end of the year. NOTABLE FINISHES: 19-Kyle Busch 27-Jimmie Johnson 35-Earnhardt Jr. CAUTIONS: 8 for 40 laps. Laps: 87-91 (Stage 1 Conclusion); 94-98 (#5 and 19 Incident=-T2); 172-177 (Stage 2 Conclusion); 181-185 (#34 Spin-T1); 234-238 (#95 Spin-T2); 242-245 (#51 Incident-T2); 270-274 (#51 Spin-T2); 284-288 (#42 Incident-T2 [Red Flag-10 Mins, 29 Secs.]). 161-172; K. Harvick 173; M. Kenseth 174-184; M. Truex Jr. 185-225; K. Harvick 226-227; K. Busch 228-234; J. Logano 235; M. Truex Jr. 236-238; M. Kenseth 239-245; M. Truex Jr. 246-271; D. Hamlin 272-287; M. Truex Jr. 288-324; K. Harvick 325-334. TIME OF RACE: 3 Hrs, 29 Mins, 52 Secs. PLAYOFF STANDINGS: 1. Truex Jr, 4168; 2. Kyle Busch, -50*; 3. Harvick, -56*; 4. Keselowski, -57; 5. Hamlin, -76; 6. Blaney, -79; 7. Elliott, -106; 8. Johnson, -108; 9. Larson, -1913; 10. Kenseth, -1913; 11. Kurt Busch, -1991; 12. Kahne, -1992; 13. Dillon, -1993; 14. Stenhouse Jr, -1997; 15. McMurray, -2003; 16. Newman, -2021.